We value our customers, and we want you to have the best chance at getting your data recovered, whether you decide to use our services or not. Even if you find that our company is not the right fit for you, we still want to make sure you at least know of other options and avoid the pitfalls of dealing with less reputable companies. We obviously want your business, and we aren’t endorsing the companies we highlight. However, there are so many choices out there that it becomes overwhelming for many people who shop for data recovery. For this section we are going to highlight CBL Data Recovery. They have been a provider of data recovery services since 1993. They started off repairing hard drives for distributors and manufacturers, before migrating into data recovery full time. In 1995 they rebranded from CBL Technologies to CBL Data Recovery. At ACS Data Recovery we aren’t so narrow minded as to try and convince our potential customers that we are the ONLY choice when it comes to hard drive recovery or RAID data recovery services. We know that customers want to be able to shop around and make informed decisions before deciding what company to use. However, we do want to make sure that you are at least shopping competitors that have a viable chance at recovering your data. In other words, the $99 to $300 data recovery companies aren’t going to be able to help you if your hard drive has been dropped and it begins clicking. We just want you to get your data back, whether that is by utilizing our data recovery services or one of our competitors, without getting taken advantage of or being misled by some of the more unscrupulous companies that permeate the industry. Price quotes at CBL Data Recovery tend to be very broad. This information is obviously subject to change from time to time. However, based on conversations we had on the phone with representatives it was hard to get them to commit to a price, or narrow the price expectation, even when an obvious mechanical problem was being described. For example, in early March of 2016 we called to get pricing for a 2TB Seagate hard drive that had been dropped. The symptoms were that of an obvious mechanical failure with a seized spindle motor, but we were still quoted a range of $400 to $2,500. The broad range of prices could be a way to just cast a net and get all of the work they can, with many customers hoping for their recovery to be on the lower end of the price spectrum or it could be that the representative on the phone just wasn’t aware of the symptoms given and simply quoted what they were told to quote for hard drives of that size. Either way is not necessarily a bad thing to do, because it’s hard to diagnose a hard drive over the phone, and even when a hard drive is dropped, you still don’t know the extent of the damage. The representative at CBL, may have just wanted to give all possibilities for pricing on data recovery since there was no way to know for sure how bad the situation was. How Does ACS Compare To CBL Data Recovery? CBL Data Recovery has been around about 10 years longer than ACS Data Recovery. We aren’t privy to information such as how many employees they have or what specific equipment they use. However, here at ACS Data Recovery, we maintain a fully equipped data recovery lab with a certified Class-100 clean room environment and we are able to work with any type of hard drive or RAID related data loss issue. Hard drive recovery is our specialty. We can recover data from hard drives that have suffered head crashes, fire damage, and even flood damage. Our lab is able to handle a large volume of data recovery work at one time. We are equipped with multiple imaging stations, and we utilize PC3000 and DeepSpar Disk Imagers to maximize our ability to recover as much data as possible from the most severely damaged hard drives. Also, the quotes we give tend to be more accurate initially. While we don’t necessarily give a flat rate price, we can give a solid price estimate based on an initial phone conversation. In the example above, there would be a 95% likelihood that the drive suffered a damaged spindle motor, and we would have quoted a price based on those symptoms. The high end of our pricing is also about 30% less than CBL. We don’t find as many reviews for CBL Data Recovery online as we do others. However, it’s important to take data recovery reviews with a grain of salt. Data recovery companies do get reviewed, but if you see some company out there sitting with a thousand 5-star Yelp reviews…chances are many of those were probably purchased. Even some of the bigger, more “official” looking review sites contain listings that are based on who pays the most to be considered “the best”. So while we aren’t endorsing CBL Data Recovery, we do consider them to be a great company, very reputable, and viable alternative that you can rely on if you choose not to use our services for some reason. Why Choose ACS Data Recovery? Our business revolves around recovering data and nothing more. It’s what we eat, sleep, and breath every day. The challenge of a difficult recovery is what we thrive on. There is no greater satisfaction to us than a job well done. Our goal is to get your data back. That is one reason why we offer these pages that highlight our competitors. They are here because even if you decide you don’t want to use us, at least use a company that is reputable. At ACS Data Recovery we try to offer the best customer service possible from the very beginning. 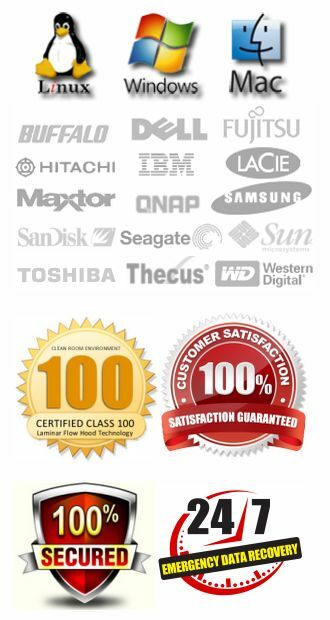 Our mission revolves around being the best data recovery provider in the world. When you talk to one of our representatives you will immediately notice a difference compared to other companies. The people you talk to on the phone work in our offices, and have a thorough knowledge of data recovery. You can even speak to an actual data recovery technician and get real answers pertaining to whatever problem you are experiencing. We will give you a realistic, and accurate price quote over the phone. We are one of the more affordable companies out there when you compare us to companies that can actually help you get your data back. Our initial evaluation is 100% free, and we will analyze and diagnose your media thoroughly. Once the evaluation is completed we will give you a firm price that is set in stone from that point forward. No matter what we have to do to recover your data the price won’t increase. 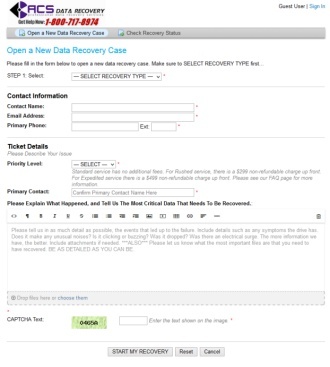 Once we begin your recovery, we don’t stop until we have your data recovered or we’ve exhausted every possible option. In some cases damage can be so severe that the data is just not recoverable by any means at all. While there are many great companies out there, we feel that our capabilities and experience easily go head to head with anyone else. We maintain a fully equipped lab with all of the latest technology as well as a certified Class-100 clean room environment. When your recovery is complete, we stand behind our work 100% with a strict customer satisfaction guarantee. To find out how we can help you call 1-800-717-8974.